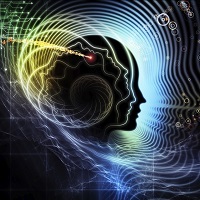 The word "cognitive" refers to learning, so this leads us back to the brain, since the brain processes information (i.e., consciousness, remembering, etc.) and enables us to "learn" new things. It would be nice if we could take a pill or get an injection and have all this "learning" added to our brain all at once. But that is not how the human brain works. The brain must learn new information and this takes time because to really learn something well, a lot of repetition is involved. The more you do something, or the more you study something, the better you will become and the more you will know about that thing. There is no short-cut to learning. If we are discussing what will WORK in helping us overcome social anxiety, then there is no process other than learning what is rational and then acting on it (thus, CBT). Today, many scientific communities, including psychiatry, as well as the new areas of brain science -- usually termed "cognitive neuroscience" -- are built on the foundation of what we in psychology call "cognitive-behavioral" therapy. 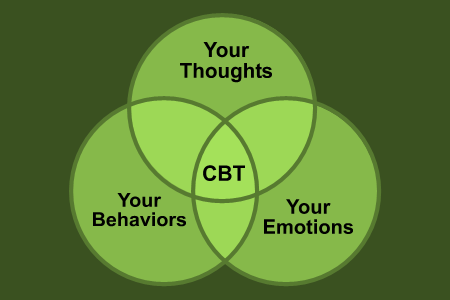 CBT is generally credited to Drs. Aaron Beck and Albert Ellis, who worked independently and challenged prevalent Freudian psychoanalytic theory in the 1950's for the majority of people with mental health problems. In the sixties and seventies, growing amounts of research began to show that cognitive-behavioral therapy was indeed the therapy of choice for many conditions. In the 1980s, this research on CBT was solidified, and more importantly for us, "social anxiety" was discovered and found its way into the psychiatric definition book, called the DSM. The massive body of research we have today, beginning in the 1990s, was supported by the National Institutes of Mental Health, among others, and was under the direction of Dr. Richard Heimberg and Dr. M. R. Liebowitz. These are the original "gold standard" studies on social anxiety and its treatment. Dr. Heimberg has been instrumental in researching cognitive-behavioral treatments for social anxiety disorder, and is currently publishing articles on how cognitive therapy changes the brain. Cognitive-behavioral therapy has been the only type of therapy to prove effective in permanently alleviating anxiety disorders and depression. What we have done at SAI is to expand on these research studies, increase awareness of the necessity of repetition, reinforcement, and rationality, and provide enough time for both the cognitive and behavioral therapy to work. Our programs at SAI are much more detailed, contain many more strategies (or solutions), and provide essential social opportunities that typical research has not studied. We have found that a comprehensive approach to helping people overcome social anxiety is most successful. In the psychiatric journal, Psychiatric Annals, Volume 30, Number 11, November 2000, the editor-in-chief, Jon Fawcett, M.D., wrote a lead editorial titled, "Psychiatrists Should Be Proficient in Cognitive Therapy". In the article, Dr. Fawcett points out that "a mass of studies demonstrating the efficacy of cognitive behavioral therapies has built up following the dogged persistence of Aaron Beck, M.D., in developing cognitive-behavioral therapies for depression and anxiety disorders..."
What is Comprehensive Cognitive-Behavioral Therapy? For a short and simple explanation of cognitive-behavioral therapy visit the Anxiety Network and its article "What is Cognitive-Behavioral Therapy?" Many adjunct and pseudo-therapies also exist. Some may be helpful as additions to CBT, and others are get-rich-quick schemes. Relaxation methods, some forms of hypnotherapy, massage, meditation, and acupuncture have been shown to be helpful sometimes in relieving symptoms of social anxiety. They are only adjuncts, however, as they do not help people to make permanent progress against social anxiety. Appropriate medications are helpful too, but they only temporarily address the problem. Only a change in the brain's neural pathways (this is what "learning" is) can cause permanent changes to occur so that we can change irrational thinking into rational thinking and then act on it. This is the heart of cognitive and behavior therapy. This is the way the human brain works. As we have discovered more about the human brain, it has helped us develop and design therapies that cause the brain to change, and allow solutions to problems like social anxiety. As many of us have found, if, in the past, we have learned irrational thoughts and beliefs, then, today, we can more easily learn rational thinking patterns and belief systems. Cognitive and behavior therapy must go together in treatment for social anxiety. One without the other is not going to provide us an acceptable solution. What we have done at SAI is to find, develop, and use many specific strategies and solutions for social anxiety. 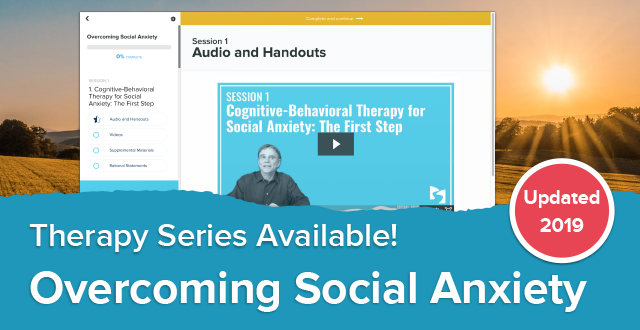 The therapy we do here at SAI, and the therapy contained on the audio therapy series, is constructed specifically for overcoming social anxiety. It is cognitive-behavioral therapy designed to help overcome social anxiety in the quickest and most effective (permanent) way. Don't worry about ups and downs and setbacks, just continue along with the therapy. There are thousands and thousands of people now, including me, who have overcome fairly severe cases of social anxiety. The GREAT thing is that if you move forward, and do not give up, you will continue to make progress and you WILL learn to overcome this dreaded way of life. The more you work on specific solutions to your social anxiety, the more progress you make. As you continue to practice, repeat, and rehearse, your brain's neural pathways literally change -- you feel this as a permanent change in your life, i.e., you no longer have to live with irrational social anxiety.